The National Safety Council is calling for volunteers to help make updates to training curriculum on pre-K child passenger restraint systems. Shown here is NHTSA training of proper child securement in an integrated five-point seat. 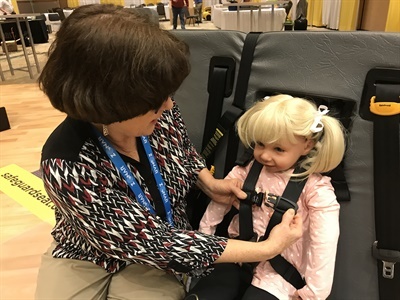 ITASCA, Ill. — The National Safety Council (NSC) is calling for volunteers to help make updates to training curriculum on pre-K child passenger restraint systems. The NSC notified its members in a letter that five years have passed since it has updated the previous version of the National Highway Traffic Safety Administration’s (NHTSA’s) eight-hour curriculum Child Passenger Safety Restraint Systems on School Buses. The most recent version was unveiled in 2015, and in the years since, instructors and participants have suggested that some changes are needed for the curriculum to be a resource to a broader audience. “The National Safety Council and NHTSA have agreed that another revision to this curriculum is due,” the NSC added in the letter. Charlie Vits of safety system supplier IMMI, who is serving as an at-large representative on the National Child Passenger Safety Board, is leading the work on the pre-K curriculum update. Anyone who is interested in participating, wants to submit an idea for an update, or has questions, can contact Vits with details of their experience related to child passenger safety in school buses at [email protected] or (317) 867-8153.